Our final shipment of No On 3 push cards just arrived today! It is critical that we get them distributed as soon as possible, particularly over the weekend. Please contact Rob Aufiero at robert@renewmacoalition.org or Michael King at michael@mafamily.org to arrange a pick up. The fight for privacy and safety in Massachusetts is really ramping up these last two weeks before the vote. We’re making use of every opportunity to get our message out in the media. 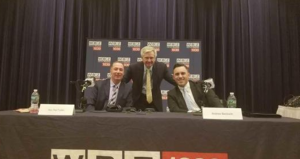 Last night, I debated the Bathroom Law on WBZ Radio’s Nightside With Dan Rea. You can listen here. Once again supporters of this law refuse to answer my questions when I ask them about the infamous Brazilian wax case.